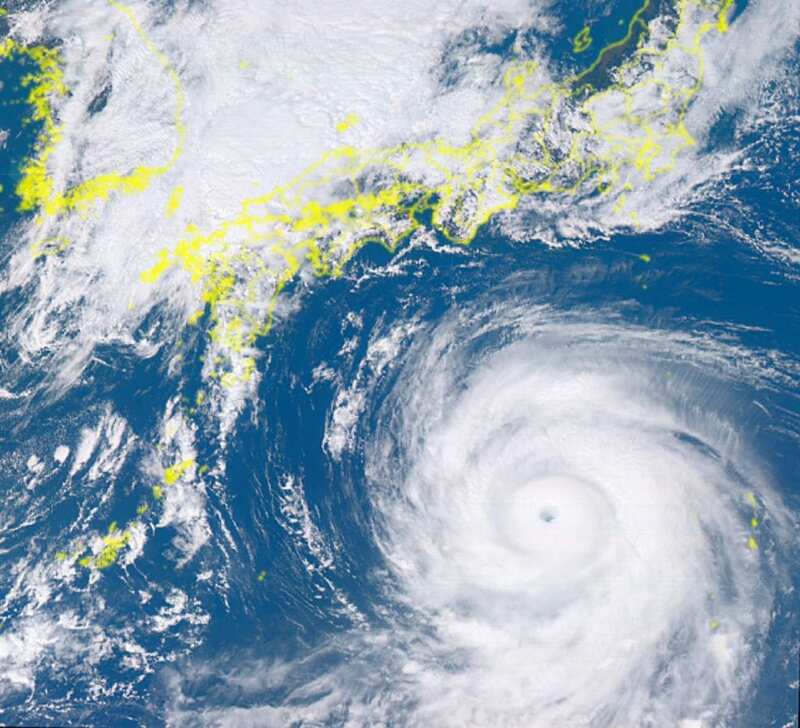 Japanese scientists and their international partners have found that additional weather observations in the Arctic can help predict the track and intensity of tropical and mid-latitude cyclones more accurately, improving weather forecasting of extreme weather events. Their findings were published on August 14th in Scientific Reports . Upper-level observations such as radiosondes in the Arctic can help to forecast mid-laitude extreme events. Impacts of the Arctic observations can transfer via the tropospheric polar vortex, which is massive low-pressure air mass over the Arctic or Antarctic regions at about 10-km altitude. The tropospheric polar vortex sometimes extends toward mid-latitudes accompanied with meandering of mid-latitude westerly jets. This extension can occur even in summer: in August-September 2016, the meandering and extension were relatively active among the recent years. Thus, the impacts of the Arctic radiosonde observations could influence the mid-latitude extremes, the courses of three tropical cyclones approaching to Japan or Northern U.S. and Greenland, since the impacts transferred trough the extended tropospheric polar vortex. Having a clearer understanding of these influences can help us better predict, track and prepare for extreme weather events such as cyclones. Currently, meteorological observations are conducted by radiosonde, a weather instrument that records meteorological data, typically released into the atmosphere with a weather balloon. However, due to hostile conditions experienced in the Arctic and the limited reach of the low pressure system, the number and frequency of these observations are limited. Consequently, there are gaps in the data that result in weather forecasts being less accurate than what they could and should be, potentially putting peoples' lives at risk. "Extreme weather events have been frequently observed in all seasons all over the world," said lead-author Kazutoshi Sato, an assistant professor at the Kitami Institute of Technology and previous member of the National Institute of Polar Research (NIPR) in Japan. "Hurricanes and typhoons are one of the most influential phenomena for human life. Precise weather forecast is critical to enable communities to adequately prepare for weather disasters," he added. For the study, the researchers performed weather forecast experiments for three tropical cyclones that occurred over the North Atlantic and North Pacific during 2016, to determine whether additional observations could help predict their paths and intensity more accurately. To supplement existing weather data observations, additional observations were conducted using weather balloons released from ship- and land-based weather stations based in the Arctic. The data were analyzed using a data assimilation system developed in Japan Agency for Marine-Earth Science and Technology, which can produce reanalysis datasets by "mixing" (assimilating) observations into global atmospheric conditions: the system was indispensable for the forecast experiments. The additional observations improved the predictability of the cyclones, allowing the scientists to track the paths of the cyclones as well as forecast their intensity more accurately. "This study demonstrated the usefulness of additional Arctic observations for mid-latitude numerical weather forecasts for tropical cyclones," said co-author Jun Inoue, an associate professor at NIPR — one of four Research Organization of Information Systems (RIOS) institutes. Additional radiosonde observations and its evaluation on weather forecasts were conducted privately by scientists, said Inoue, adding that while "this 'quiet revolution of forecasting' is, of course, beneficial for end users," it is difficult to implement sustainable Arctic observations due to the harsh environment in the Arctic. "Now, stakeholders and decision-makers can start to consider the future Arctic observing network to reduce the socio-economical risks associated with extreme weather events," said Inoue. "Our study contributes to providing such an opportunity." "From July to September 2018 additional 3,000 radiosondes have been launched from the Arctic region to reduce the uncertainty of forecasts in the Arctic and beyond as part of the Year of Polar Prediction (YOPP) project," said Inoue. "Many meteorological centers will evaluate their impact on the atmospheric circulation in the Northern Hemisphere. Understanding the predictability of the atmosphere, ocean, and sea ice will progress with advances in the Arctic observing network and numerical model development," he said. With extreme weather events becoming more frequent and more intense due to climate and ocean warming, being able to more accurately predict and track tropical cyclones can help communities be more prepared for potentially devastating storms, which in turn can help save lives. Other authors of this study are Akira Yamazaki of Japan Agency for Marine-Earth Science and Technology, Joo-Hong Kim of Korea Polar Research Institute, Alexander Makshtas, Vasilli Kustov of Arctic and Antarctic Research Institute, Marion Maturilli and Klaus Dethloff of Alfred Wegener Institute. The Research Organization of Information and Systems (ROIS) is a parent organization of four national institutes (National Institute of Polar Research, National Institute of Informatics, the Institute of Statistical Mathematics and National Institute of Genetics) and the Joint Support-Center for Data Science Research. The mission of ROIS is to promote integrated, cutting-edge research that goes beyond the barriers of these institutions, in addition to facilitating their research activities, as members of inter-university research institutes.